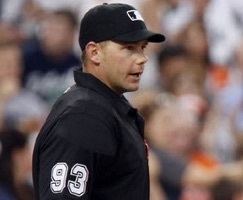 Umpire Will Little's wife Katy prematurely entered labor, prompting Will's early departure from the second game of a Brewers-Reds doubleheader in Cincinnati, according to reports into the UEFL. The Reds had reported a "family medical emergency," while Cincinnati radio announced that Little's wife Katy was "headed to the hospital to deliver a baby." A thebump.com registry for the Littles indicated a Dec 25, 2015 due date for a baby girl. More information will be forthcoming as it becomes available. After an ensuing rain delay, 2B Umpire Phil Cuzzi substituted for Little at home plate with crewmates Jim Wolf and Toby Basner manning the bases. Crew Chief Gerry Davis, who had worked the first game of the doubleheader behind home plate, filled in at third base.